Paleoclimate proxy records are sources of data that tell us about past climates. They are especially useful in helping us learn about climate during periods prior to human records. Tree rings, ice cores, and sediment deposits in lakes and seas are just a few examples of paleoclimate "proxies". Two factors related to time are important measures of paleoclimate proxy data. The two factors are the span of the record and the resolution of the record. This graph shows how the resolution of climate proxy data tends to get poorer as the time span covered by a type of record gets larger. "Span" refers to the range of time for which data from a given type of proxy exists. 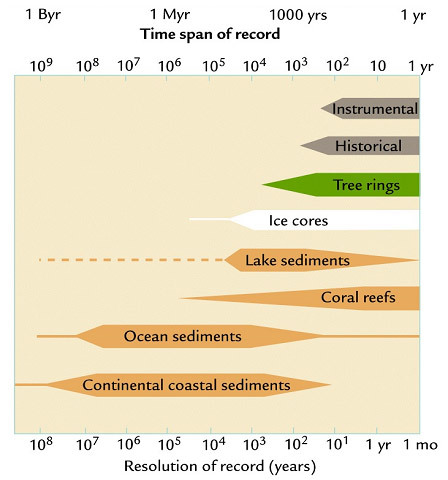 Tree ring records span the most recent few thousands of year; ice core records go back as much as hundreds of thousands of years; and fossils can be up to hundreds of millions of years old. If we are interested, for example, in studying the Medieval Warm Period (10th to 14th centuries AD), tree ring data could be very useful. However, if we want to know about the climate during the last days of the dinosaurs (around 65 million years ago), even ice core records would be of no use. The span of a proxy record tells us how far back in time the record allows us to peer. "Resolution" tells us how much detail is to be found in a given type of proxy data. Each ring in a tree corresponds to a growing season, so tree ring records provide a resolution of one year. We can use tree ring data to assemble a climate record with an annual resolution; we can know what conditions were like each year. Ocean sediments, on the other hand, have resolutions on the order of a century. The uppermost layers of ocean sediment can be disturbed by currents or by creatures burrowing through the sand, so short-term trends in sediment types can get blended over time. So we can tell, using ocean sediments, whether two centuries had different climates, but we can't determine what the decade-by-decade trend was like. Typically, records that have information about the distant past tend to have poorer resolution than do records of more recent times. Data sets that have large spans tend to have lower resolutions, while records with short spans tend to have better resolutions. Our knowlege of paleoclimates gets blurrier the further into the depths of time we plumb. Scientists must be aware of spans and resolutions of different record types when looking for data about a specific time in history. The records must span the time period of interest, but they must also have fine enough resolution to address the issue being studied. Scientists often use multiple data sets that span the period of interest, but that have different resolutions. This makes it more challenging for the scientists to make "apples-to-apples" comparisons between the findings based on one type of record and the findings based on a different type.